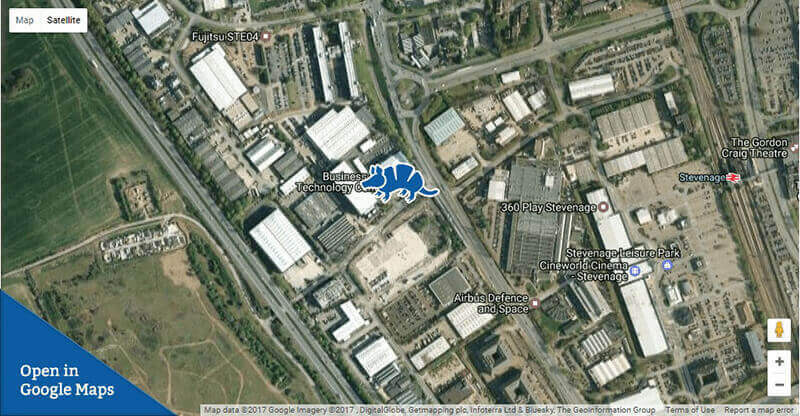 Our offices are located in the Business and Technology Centre in Stevenage just 25 minutes by train from London’s King’s Cross and within easy access of the A1(M). From A1(M) Junction 7 – take the A602 exit to Stevenage and take the 3rd exit onto Broadhall Way / A602. At the roundabout, take the 1st exit onto Gunnels Wood Road. In approx. 1 mile turn left onto Bessemer Drive. There is free ample parking on site. There are regular rail services from London Kings Cross to Stevenage (approx. 25 mins), as well as Cambridge and Peterborough. The Stevenage Business and Technology Centre is approx. 10 minutes walk from Stevenage station. The Premier Inn Central is located within walking distance of the office. There is a good selection of other hotel accommodation that can also be found nearby. © Armadillo Sec Ltd 2019 - All rights reserved. Armadillo is a registered trademark of Armadillo Sec Ltd.